Just a few days ago, the highly anticipated 6.0 version of Cheetah3D was released. Version 6.0 incorporates many (many) new features and improvements. For an extensive list of these, visit their site. With this release, Cheetah3D moves decidedly into the FX field, with the inclusion of a Bullet Physics engine—which can be combined with the existing particle and effector forces features to produce very interesting effects. Now, I've used other bullet physics engines (mainly in Blender), and in comparison, Cheetah3D's is very good and intuitive. Although at first it is hard to decipher the meaning of some of the settings (and the documentation, as we're used to, is a bit lacking), with just a bit of fiddling around one can get pretty decent results in no time. Most simple simulations can be viewed right away by hitting the Play button in the Timeline window. 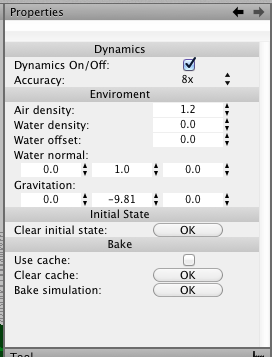 For more complex simulations, it is recommended to use the Bake simulation function, which can be found in the Dynamics panel (figure 1). 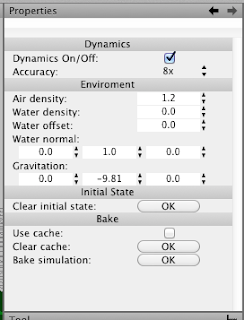 To access this panel, click on the new Dynamics button in the Toolbar (figure 2). The Dynamics panel contains one of the most important settings to achieve realistic and accurate simulations: the Accuracy setting. I recommend setting it to the highest number, 8x—always keeping an eye on scene-level polygon count. In Cheetah3D, bullet physics simulation works like this: you decide which objects are going to be interacting in a scene. 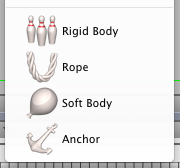 You assign bullet physics tags to them, depending on whether they are moving or static rigid bodies (not flexible), soft-body objects (flexible, bendy stuff), or rope-like objects. There is an additional Anchor tag that lets you define selected points/spline control points as static—imagine a flag attached to a pole at two spots, or a string hanging from one end. Figure 3. The four new bullet physics tags. So, what else is new. Well, I think plenty of stuff. 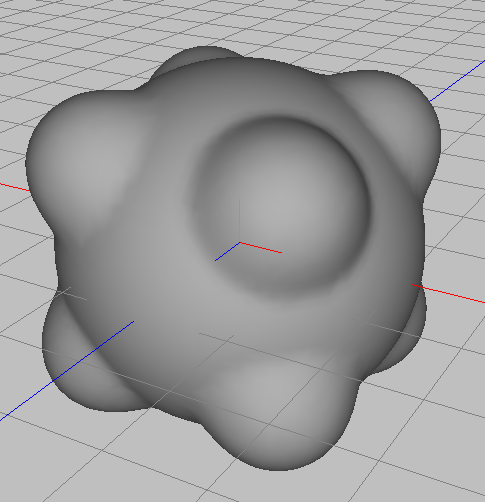 Perhaps the next feature in order of importance is the addition of a new type of object: metaballs—or isosurfaces in Cheetah3D. Personally, I think there might have been more snazzy features to add (hair, material system improvements, Boolean operation improvements, motion blur, smoke/liquid simulation, basic sculpting tools beyond the existing Magnet tool), but who know, this might end up paving the road for more organic oriented modeling in Cheetah3D. Isosurfaces are implemented through a new creator object called Isosurface. To use it, select it from the Creator menu. Then, add objects inside of it. They will combine in strange and inspiring ways. You can add a Metaball tag to individual objects inside the Isosurface creator to fine-tune their behavior (see figures 4 and 5). Of the remaining new features and improvements, I'd like to mention two. The first one is a revamped, really good Bevel tool (now you can do multi-level, subdivided, concave and convex bevels!). The old Bevel tool was OK, but it was so basic that I almost never used it—I like rounded edges. The other new, incredible feature is the ability to key the position of individual vertices and Bezier curve points directly, without the need of using a Morph tag. For quick and dirty animation/deformation, it is absolutely great. All in all, I feel this is a very solid update, with lots of new goodies. Just the bullet physics implementation is worth the (reduced) price of the upgrade. As always, I feel that Cheetah3D is missing good documentation. However, Tonio Loewald, a long-time Cheetah3D user, has just released what could be a definite guide to the program, You can find it here.